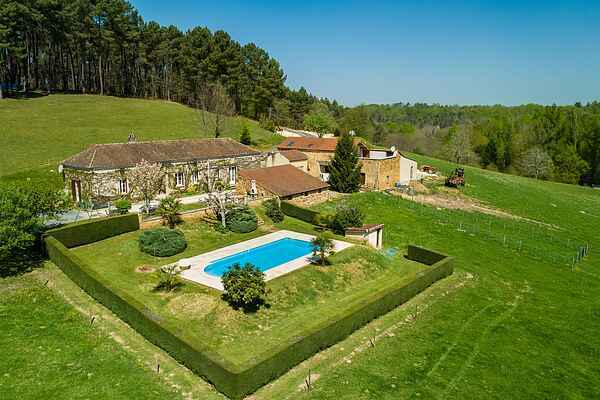 Beautifully situated holiday home in the green rural surroundings of Loubejac. The view from the terrace over the vast forests, and corn or tobacco plant fields is stunning. The private swimming pool looks tempting, and the children can have fun on the small lawn with swing set. Or they play a game of table tennis, or pétanque. Indoors the house is conveniently equipped as well. Of course you also have to pay a visit to the area you have been admiring from your terrace. The forests (many chestnut trees, corn and tobacco fields; the surroundings are perfect for picnics and walks. A visit to the bastide town Villefranche-du-Périgord (4 km), with its beautiful market square and many fun shops, is well worth your time. In the area you will find lakes you can swim in (Prats-du-Pèrigord, 7 km; Frayssinet, 10 km; and Cazals, 13 km). Monpazier also has many sights that justify a day trip. The Dordogne valley, which is ideally enjoyed by canoe, the caves of Les Eyzies (46 km) and the city of Cahors (42 km) offer you plenty of possibilities for either being active and sporty, or enjoying some peace and quiet along with some culture. House made for 6 adults and 3 children.